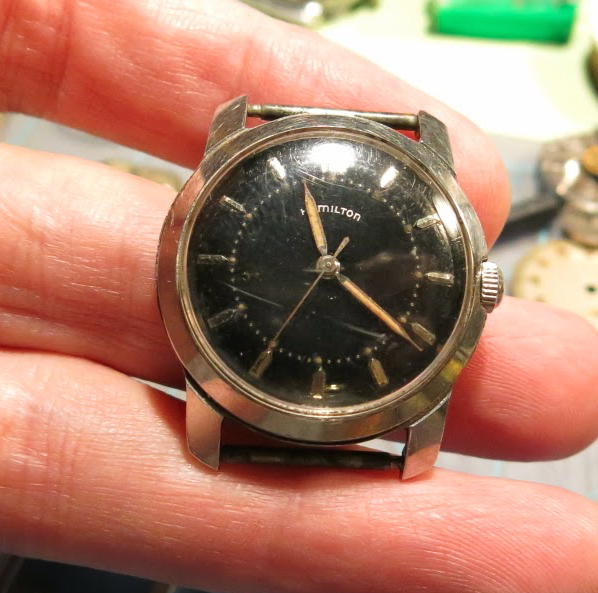 I recently purchased a Hamilton watch that for a little while I thought might be a "franken". A franken is a watch that looks like it's a real model but is actually a mixture of parts. In other words, it has a case from one model with a dial from another with hands from something else. Or it could be a Hamilton movement inside of a jewelers case with a generic dial and hands. Frankens can sometimes even come in solid gold cases - but from a collector's point of view they are of no real interest. 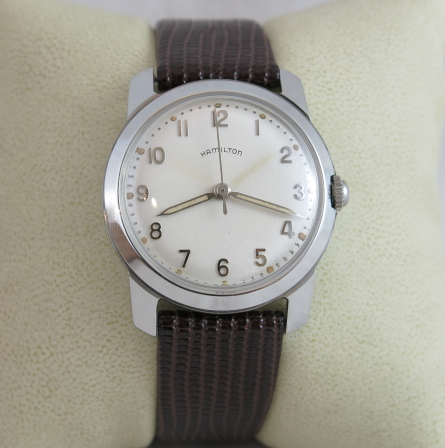 Anyway, once I was able to identify it I realized the watch I purchased is a 1957 Jason. The Jason came in three different dial options. A marker dial with a pearled track in either white or black, as well as an all numeral dial with pearled track in white. All the dials have luminous hands and dots on the dial's hour markers so you can read the time in the dark. The Jason was made for only two years and came in an all-stainless steel waterproof case. 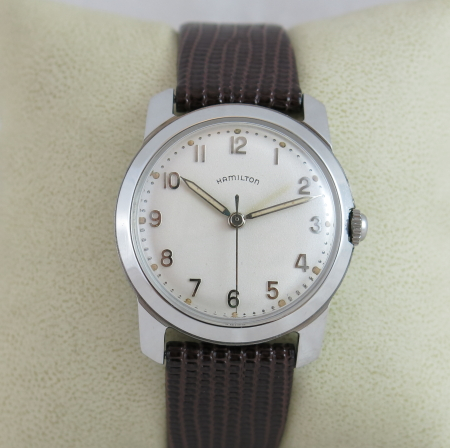 In 1956 the watch was called the Jason B - because it used a Hamilton Illinois movement. 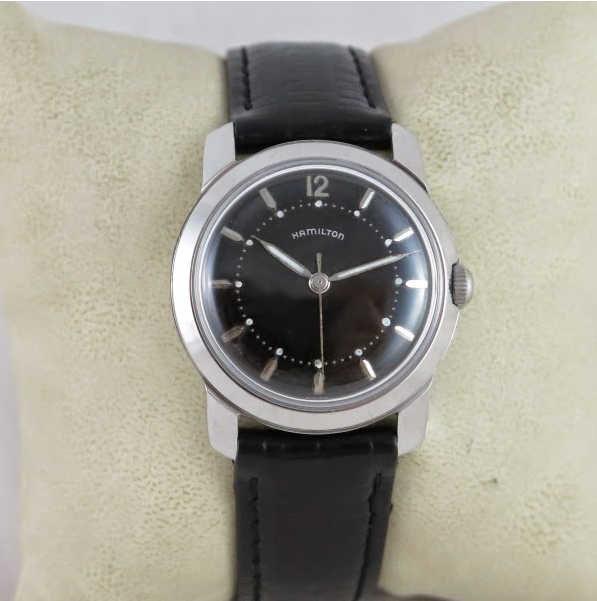 The 1957 and 58 Jason models use a 17 jewel Hamilton 671 movement. One thing to note in the catalog ad is the shape of the hands. I believe the shape is called an "open dagger". 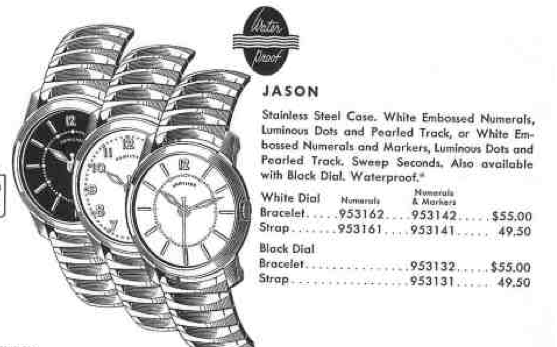 I have seen several Jasons but never one with an all numeral dial and never one with the style hands in the catalog. Most of the time the catalog advertisements were very accurate renditions of the actual watch - but they are always artists renderings. There are rare occasions where the rendering doesn't match the reality. There are also known Hamilton documents that dictate the use of other parts when necessary (for example during the Christmas season). If parts got low other parts would be substituted. The interesting thing about my Jason is it is essentially new old stock (NOS). I don't think it was ever used. It had a lot of dust on the outside but the inside was pristine. When I serviced it I noticed the "set bridge" was broken. The set bridge is a spring mechanism that helps hold the watch in the winding position or the setting position. It holds the stem out when you set the time. A broken set bridge can make setting and winding difficult. I suspect that's why this watch was never used. So without any further ado, here's a photo of my "new" Jason. Note how the luminous material on the hands burned a mark onto the dial because they never moved away from the 10:10 position that Hamilton usually set the watch to prior to sale. I recently landed a black-dialed version of the Jason with the numeral and marker dial. and here's after. It's amazing what a difference fresh lume and a new crystal can make to a tired old watch.